Over the weekend I've shared a new eye makeup look which I called the Floral eye makeup look. 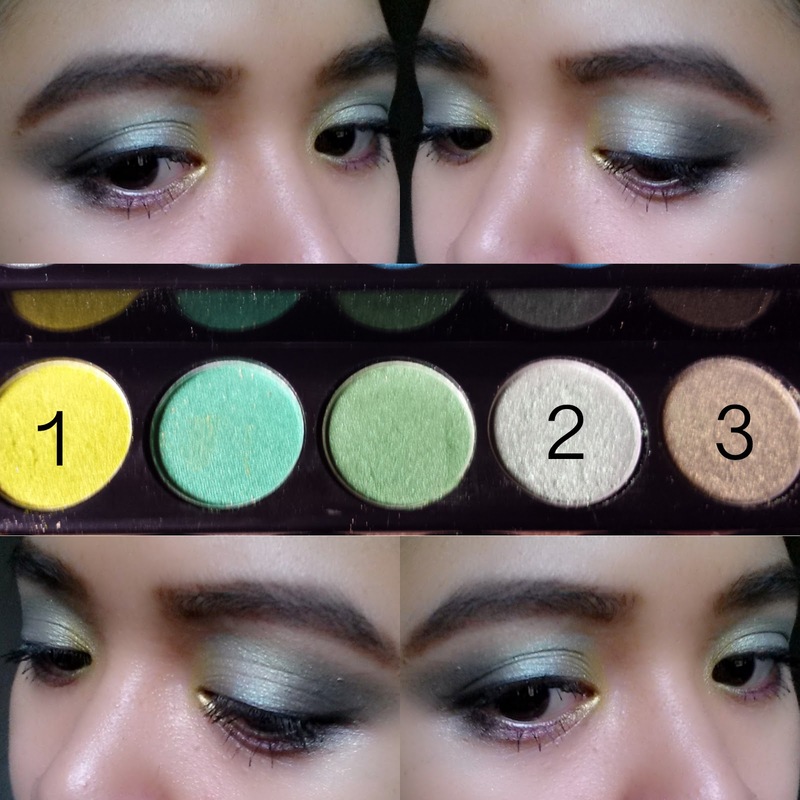 So for this post I'll be sharing the tutorial for the said eye makeup look. Note : The palette captured on the middle photo is a small portion of eyeshadow shades from the Sephora Makeup Academy Palette. These colors are located on the fifth row counting from the top row of the palette. 1. Prime your eyes. This helps enhance the colors of your eyeshadow and make it last longer. 2. Apply chartreuse yellow or yellow green eyeshadow shade (labeled #1 from the uppermost photo above from the Sephora Makeup Academy Palette) on your inner corners of your eyes and 1/3 parts of your upper eyelids starting from the inner corners. 3. Apply eyeshadow shade #2 labeled from the uppermost photo above from the Sephora Makeup Academy palette on the remaining 2/3 parts of your upper eyelids. Blend! 4. Apply eyeshadow shade #3 on your crease. Blend with the rest of your application making your way out just like creating a cat eye look. 5. 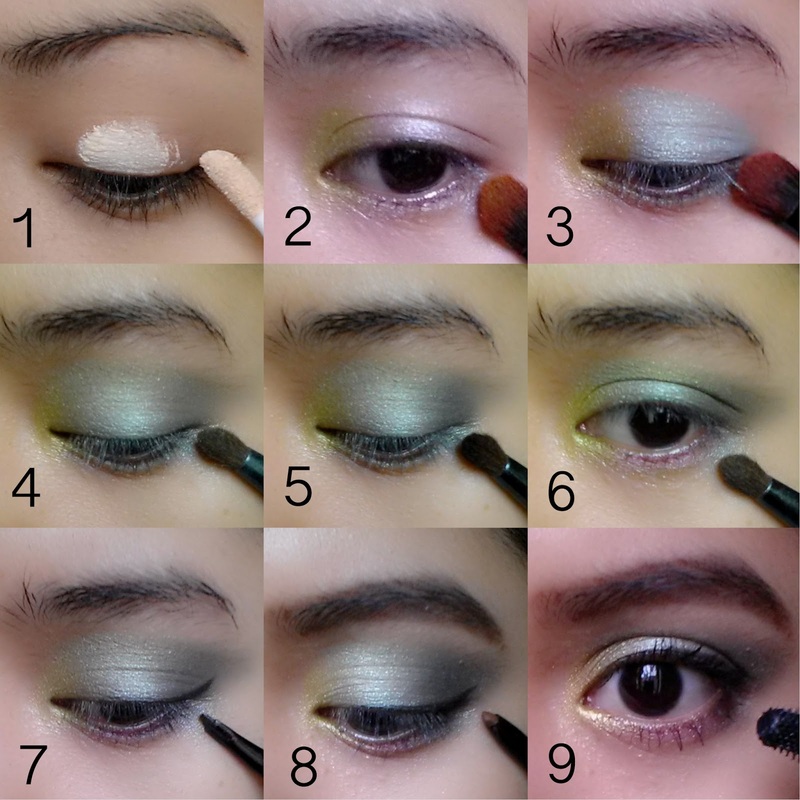 Apply a dark green eyeshadow shade just on the outer corners of your eyes and blend it as well. 6. Apply a fushia pink eyeshadow shade on your lower lash line. 2/3 parts starting form the outer lash line. 7. Apply a black eyeliner on your upper lash line. Wing it if you will. 9. Curl your lashes and apply mascara. Continue makeup with the rest of your face. And you're ready to go. Love the colours you've used for this look and your eyes are so perfect too!! Have a sweet day my beautiful Gladys.